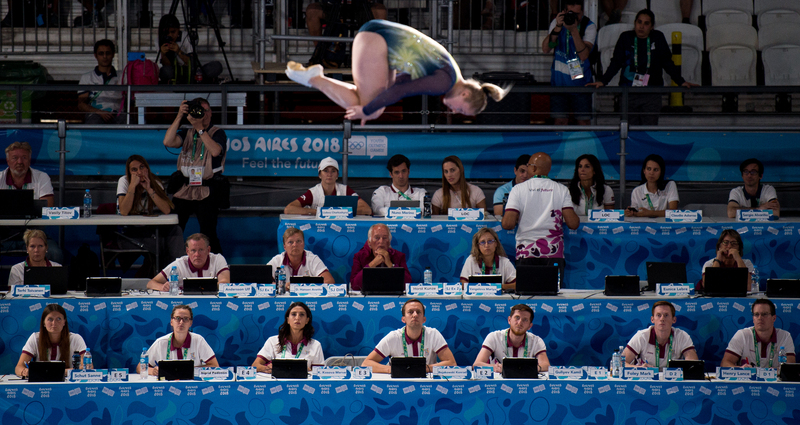 It was perfect timing when the DJ at the American Pavilion started playing pop star Taylor Swift’s Shake it Off prior to Jessica Pickering’s turn on the trampoline in the event finals. The Australian needed to dance and Swift’s song could not have been more appropriate. “I still had to wait a little while before competing, so I thought I’d just dance a bit,” said Pickering, who shimmied, shook and jumped around the competition floor moments before her final routine. Pickering’s boogey-beat did the trick to ease her jitters as she landed on the podium in second position. Afterwards, she bounced over to the kiss-and-cry corner, waving and smiling to the camera, while waiting for her score. She sprung up when she saw the result coming through – her 51.645 points had just propelled her to the gold-medal position. It did not take long before the gold turned to silver for Pickering, as China’s Fan Xinyi scored 52.560 points to take the top spot. Russia’s Vera Beliankina scored a 51.435 to take the bronze. Fan’s victory was China’s third gold medal in the women’s trampoline event in a Youth Olympic Games after Dong Yu in 2010 and Zhu Xueying in 2014. “There is no secret formula for trampoline gymnastics in China. It all comes down to very hard work and dedication and love for the sport. Today I showed what I can do and that led to a gold medal. I am very happy with that result,” she said. In the men’s competition, Fu Fantao (CHN) clinched the gold ahead of Andrew Stamp (GBR) and Benny Wizani (AUT). First-place qualifier Ivan Litvinovich (BLR) ended in fourth place after some minor mistakes, while third-place qualifier Ruben Tavares (POR) ended sixth. Even though the trampolinists have finished their competition at Buenos Aires 2018, they are already thinking about the next step: the 2018 Gymnastics Trampoline World Championships in Russia in November.